As we move into the Summer months of 2013, I thought it would be nice to look back at the series of races that took place this Spring. You will notice the new team kit! 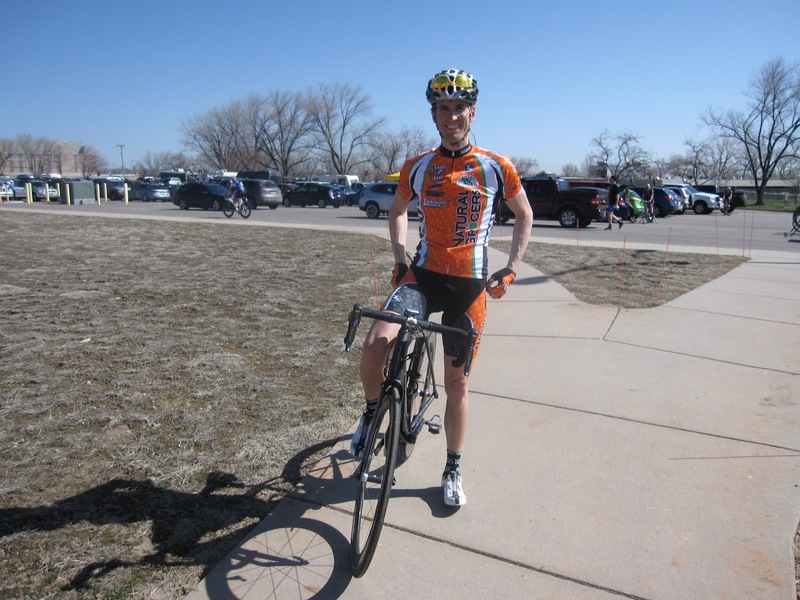 Hubby joined up with the Natural Grocers cycling team in April. The team is one that has good results in the local racing scene, but they like to enjoy themselves while they're doing it. Not too serious, but they do work hard! So far, it's been helpful for training and racing to have some teammates around, and it's a great way to be a little more social with the guys. 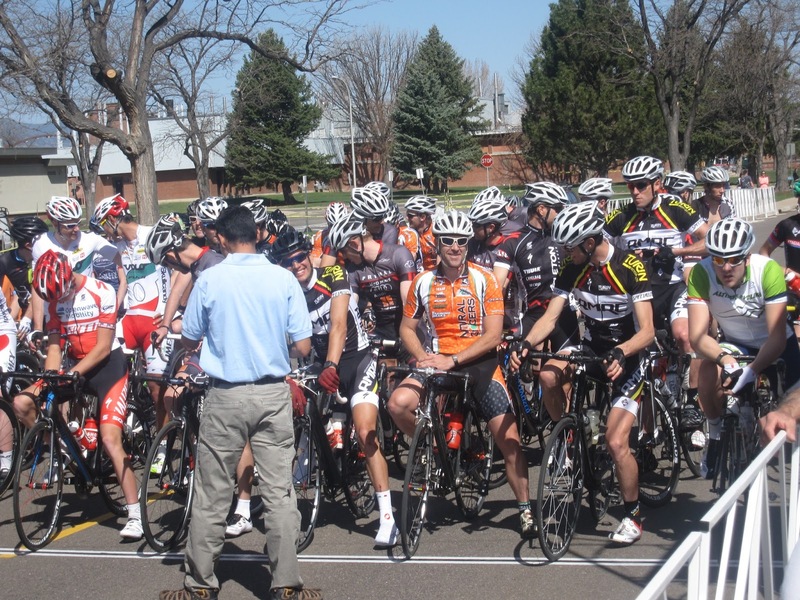 On Saturday, April 27th, we headed downtown Denver for the "Denver Federal Center Classic." The 4 mile circuit course took the racers winding around the center streets. I had a front row view of the Start/Finish line in my little orange chair, and it proved to be a hard race. 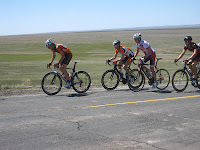 I watched as the group broke up quickly, and just a few guys went off the front to take podium positions. 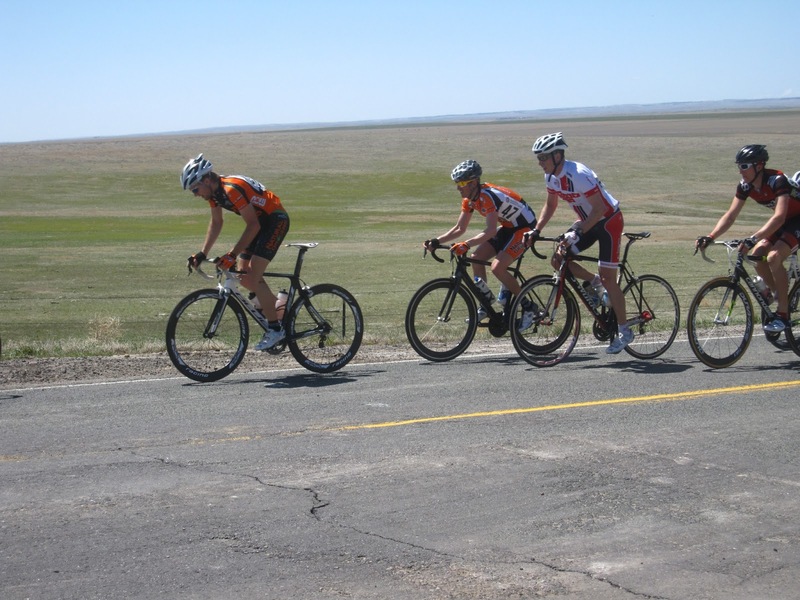 As if one race per weekend isn't enough, we headed back out on April 28th for the "Deer Trail Road Race" in a small little farming town past the airport. The course provided several rolling hills for climbing, and hubs came into his own throughout the course. While a lot of the racers struggled up the climbs, he looked comfortable and quite happy to be out there! I even caught a picture of him smiling and waving as he passed by with the group. He pulled out a top 10 finish and got his first set of upgrade points as a Category 3 racer! Slowly but surely, on his way to that ultimate goal of Category 2 racing!! 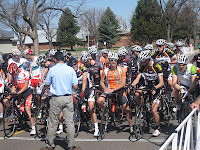 May 18th and 19th took us right into our back yard for the Crit Race and Road Race of the omnium "Superior Morgul Race." The course for both races started just a quarter of a mile from our apartment complex, so I had the easy job of walking to and from the start line to watch everyone. And you can see why we live where we live - amazing views from my seat! Immediately, I could tell that this was a race that everyone was gunning for a podium finish. The Category 3 race moved just as fast as the Pro, 1, 2 Categories race before them. I was stunned watching these guys go!! Since the hubby was on home turf, being in our own neighborhood, he was familiar with the course and got to claim his free beers after he crossed the finish line! HA! It was a tough couple of days, but we both learn more and more about the Colorado cycling scene each time we attend a race. It really is a whole other level! 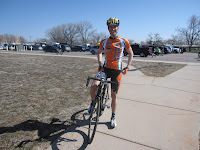 Last week, we also drove up to Longmont for hubby's first "Twin Peaks Mall Crit Series" race. It takes place every Thursday evening, starting in April and ending in August. The course is a winding route through the mall parking lot, and he pulled out another top 10 finish!! I expect that we'll be heading to Longmont most Thursdays this Summer, and it will be a great opportunity to keep the racing tactics fresh. Our next race is coming up this weekend, and then we should start to get into a steady flow of weekends on the road. I'll be sure to do more updates as we go! We should have known that a small streak of good luck was coming our way. The day before, we were offered free tickets to see the Rockies play the Giants at Coors Field in Denver. Our seats were just to the right of home plate, only 20 rows up from the dugout. We found a microbrew stand, a gourmet hot dog booth, and the pretzel cart almost right behind our section exit. The weather was perfect. I fit into my shorts for the first time in YEARS. And the Rockies were ahead for most of the game, ultimately pulling out the win against the Giants! But that wasn't even the highlight of the day! 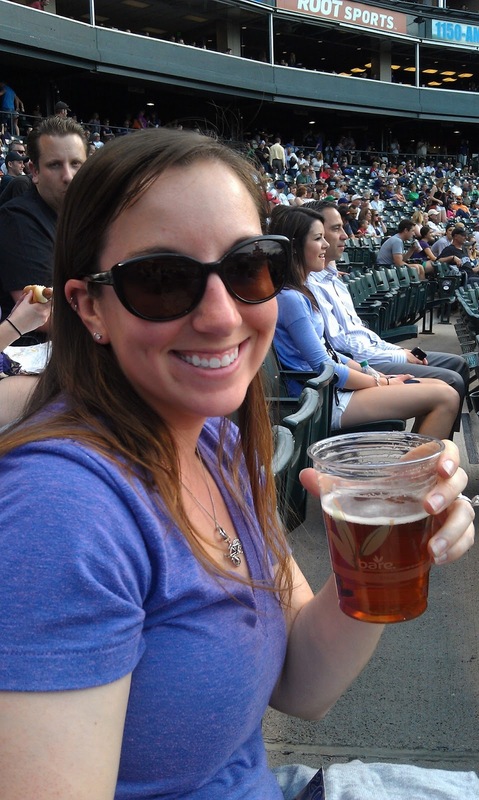 During the 5th inning, Rockies at bat, a foul ball comes flying past our heads and bounces off the upper deck wall. The hubby stands up with his hands outstretched. His glasses fall off of his head, and he pulls off the one handed grab so they don't crash to the ground. And with the other free (BARE!) hand, snatches that foul ball right out of the air!! It was one of those rare moments that people always wish would happen to them, but so few actually get the opportunity. Amazing! And now, that baseball will live in the study as a reminder of such good luck. Cross one off the bucket list. In preparation for my Sprint Triathlon in June, I decided that it would be a good idea to get out in a race to practice my transitions. 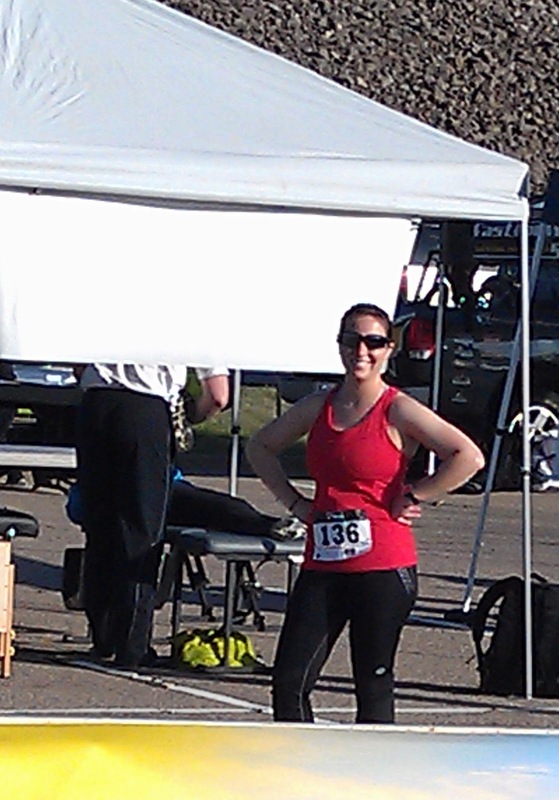 I signed up for the Barkin' Dog Duathlon, which took place on Saturday, May 11th. I was told that it was a chilly morning, but my nerves had me running warm! We showed up a bit late, and I was one of the last people to get my bike into the transition area. But thanks to a very nice woman who helped me, I was able to find a spot to set up. I was in the last starting wave of the morning, and we started our short run at 7:33am. 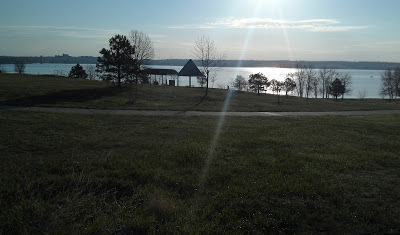 1.25 miles felt like a nice warm up, and then I jumped on the bike for an 11 mile loop. By time I got back to transition to the longer run, I was already 20 minutes ahead of my goal pace!! My legs felt so tired during that 5K, but I ran faster than any of my recent training runs, and finished 23 minutes ahead of my goal time of 1:45:00. Super proud of myself!! And my transitions could not have been better, for what I was hoping to accomplish. Two weeks left until the Longmont Triathlon. I'm nervous about the swim, for sure. 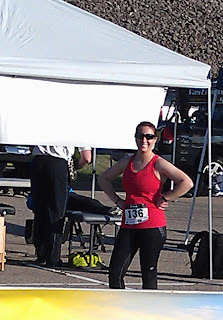 But at least I know that I can feel confident in the transition area now.